Band of Brothers is a series that John Alvin did images for, and these are some of the few available for sale. 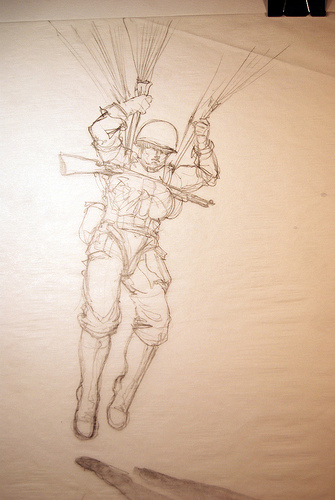 Band of Brothers 1 is an original graphite production drawing that is signed by John Alvin, whose artwork is skyrocketing in popularity and interest due to the release of The Art of John Alvin book. Order your copy of the book here. The narrative centers on the experiences of E Company ("Easy Company") of the 2nd Battalion, 506th Parachute Infantry Regiment assigned to the 101st Airborne Division of the United States Army. The series covers Easy's basic training at Toccoa, Georgia, the American airborne landings in Normandy, Operation Market Garden, the Battle of Bastogne and on to the end of the war, including the taking of the Kehlsteinhaus (Hitler's Eagle's Nest).